After you have upgraded your beginner farm house to the Standard House size, a new feature will be available to you. The Clothing Closet will be inside of your house, which allows you to change the clothing outfit, hat, and eyewear your farmer may be wearing. You can do this whenever you feel like it once the closet has become available. The closet does not change your hair or face options. Hairstyling is at the Sharaku hair salon in Tsuyukusa, and face options is by giving a Lulukoko crop to guardian Witchie. You always have to wear clothes (ah drat! ), but wearing a hat or eyewear is optional. To change your wearable items, simply select one of the three choices to access the clothing, hats, and eyewear that you have obtained. The interior style of your Clothing Closet will either be Western, Eastern, or Tropical themed based on the interior style you selected for your farm house. The closet will not change into the fancier mansion-style themes such as Jungle, Bow Meow, Undersea, etc. If you selected one of these upgraded interior styles, the closet will remain at the Western, Eastern, or Tropical theme you last chose. For example, if your had a Tropical theme interior and then had Ludus change your interior theme to Golden style, your Clothing Closet will remain as Tropical style. If you wanted to change your closet to Eastern or Western style, you'd have to make Ludus change to the style you wanted and then change back to Golden style. The more items you craft for your closet, the more items will appear on the back walls of your Clothing Closet. The three interior styles will display different items. For example, a Western style Clothing Closet will display the Red Ten Gallon Hat if you own it, but it won't appear on the back wall in the Eastern style Clothing Closet; instead, you would see the Hachimaki if you owned it. Winning festivals and completing Town Link Rank requests will get you some of the wearable items, but the majority of them will be purchased from the three clothing tailors in the game: Miranda in Westown, Shizu in Tsuyukusa, and Mr. Do-it-all Ludus in Lulukoko. 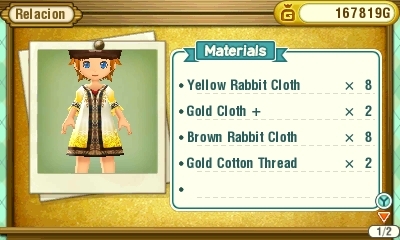 Many of the outfits will become available to order at the tailors as you raise your Town Link Ranks with the villagers, but there are a few that need special requirements such as shipping certain items or completing other tasks. To order an item, visit the tailor and select your choice from their inventory. The materials needed can come from either your bag or your farm house Storage Box, so you don't have to carry everything around with you in your bag. Each inventory item displays a small preview of what the finished product will look like. Once the outfit is ordered, you must come back the next day (or a later day is okay) to have the item sent to your Clothing Closet. You cannot take an item out of your closet, you cannot ship your clothing items, and you can only purchase it from the tailors one time. After the item has been crafted and sent to you Clothing Closet, the item will appear with a MADE label on its entry in the shop. You cannot trade outfits to other players at Connection Island, although you can trade the materials you need in your game to craft the clothing items. The tailors will not need a specific Star Rank of your materials, but will need the exact materials for crafting. For example, if a clothing pattern requires White Cloth, you can't use White Cloth+ as a substitute. Once you buy all of the available items the tailor has, trying to go into the tailor's clothing inventory will return a message from the shop vendor that you've purchased everything they have. If you can still access the clothing inventory, even though everything is marked as MADE, then there are still more items available to unlock at that tailor. Some hair styles from Sharaku are too poofy to wear certain hats. The hats will be faded in the Clothing Closet if you can't wear it based on your hair style. You can wear the same items whether you are playing as a boy farmer or a girl farmer. As you raise your Town Link Rank with Westown, Gulliver's will start to sell basic colored cloths. 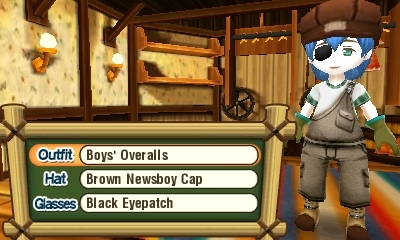 White Cloth and Black Cloth appear in Cortez's shop inventory at Westown Rank D, and the remaining colors unlock at Westown Rank C.
Besides basic cloths, the clothing outfit choices may require you to obtain plus-quality cloths. These are created by placing plus-quality animal fur into the Textile Mill. You can make your wooly farm friends produce plus-quality by increasing the animal's Byproduct Level, which is done by feeding it Crispy Treats. These are for sale at the animal vendor shops for 200 G each after you win an Animal Festival. It will take about 35 Crispy Treats to increase your animal's Byproduct Level from Rank E to Rank D. The higher the rank, the greater the chance of a plus-quality good appearing at harvest. The Textile Mill can then convert your plus-quality fur into plus-quality cloth. Since at some point your animal might only produce plus-quality goods, the Textile Mill can also craft normal-quality cloth using plus-quality wool. You won't need to have two animals on your farm, normal and plus-quality, to ensure that you can still craft regular cloths. Cotton and Linen are a crop you will grow year round on your farm plots. These crop seeds are for sale at the 99 G and Up shop in Tsuyukusa. Cotton Seeds appear once Tsuyukusa is Town Link Rank C, and Linen Seeds appear once Tsuyukusa is Town Link Rank B or after you have shipped a total of 100 Cotton. Cotton will take 10 days or less to mature, and Linen will take 8 days or less. These crops can be converted in the Textile Mill to cloth and thread. Each item in your Clothing Closet will have a culture, style, and color associated with it. You can see these statistics by selecting the clothing item and then pressing the Y Button on your Nintendo 3DS. These stats are only important when participating in the Fall 22 Fashion Show. Del Cossa will judge your fashion sense based on the culture, style, and color of what you're wearing. Villagers also have clothing that they like and will comment on if you are wearing it when talking to them. You'll earn a bonus +100 FP if they complement you on your fashion sense. For marriage candidates, you'll also earn +1 Affection Poin (AP).